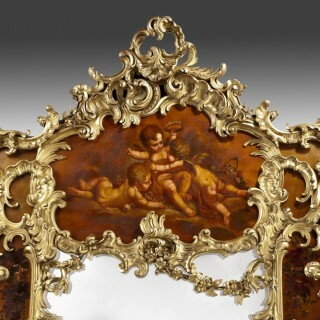 This grand mirror has a central rectangular plate framed by ‘vernis Martin’ panels of floral sprays centred on a charming scene of three putti in a bower, one being crowned with a floral circlet. 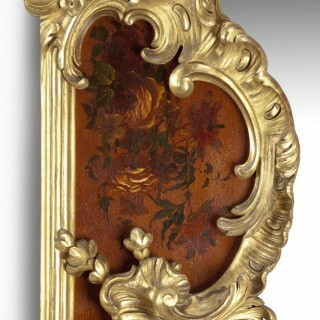 These are overlaid with exuberant giltwood garlands, rocailles and C-scrolls. The reverse bears the inventory number JKP 3306(2). French, 1888. 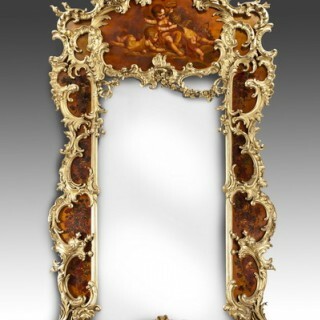 This magnificent mirror was supplied as part of a suite for King Willem III and Queen Emma of the Netherlands commissioned from Louis Majorelle, cabinetmaker at Nancy, for the refurbishment of the drawing rooms at Het Loo Palace around 1887. 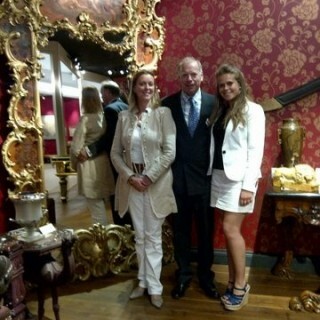 Majorelle had exhibited at the 1883 Great Exhibition of Amsterdam and it is probable that the Royal couple admired his work there. 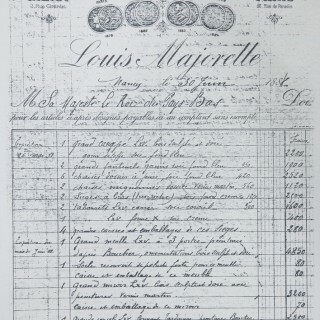 In May/June 1888 he delivered ‘1 grand miroir Louis XV bois sculpté et doré avec peintures cernis marting frs 3200’ (Royal Dutch Archives). Louis Majorelle (1859-1926) was the son of Auguste Majorelle of nancy who specialized in making furniture in the 18th century taste. After training as an artist under Millet in Paris, Louis returned to run the family firm in 1879 where he gradually introduced new designs and technologies. By 1900 he had become the main producer of Art nouveau furniture in France, if not the whole of Europe. His factory was destroyed in World War I but he rebuilt it and once again changed his output to suit the fashion of the time by producing restrained, rectilinear styles favoured by the Art Deco genre.